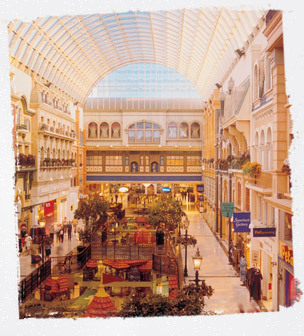 West Edmonton Mall has always been one of the main attractions in Edmonton - gateway to the north. The mall is one of the largest shopping complexes in the world and offers its visitors a vast array of activities in addition to shopping. Now Hollywood has come knocking and Edmonton is preparing to go to the movies! "GREATEST INDOOR SHOW ON EARTH: MALL STARS IN HOLLYWOOD MOVIE"
King Kong, Godzilla, that asteroid that Bruce Willis had to blow up before it creamed earth…they were big stars, sure. But now Hollywood is setting its sights in Alberta’s capital city of Edmonton on a huge star with intimidating proportions – 5.3 million square feet and 48 blocks long. The West Edmonton Mall (WEM) – one of the world’s premiere shopping and entertainment centers and among the largest – is starring in the new Insight Film Studios production, Christmas in Wonderland. Patrick Swayze, Chris Kattan and others will be in the film about a family that moves to Edmonton, which is the international gateway city to the North. Filming began in late April and runs until early June, 2007, with release of the movie tentatively scheduled for this November. If you visit during this filming period, you’ll find the massive mall decked out in Christmas decorations. The WEM is an all-seasons attraction that’s as intriguing in spring and summer as in winter, especially if you’re making the trip from afar. With its on-site Fantasyland Hotel featuring themed rooms, giant indoor water and amusement parks, restaurant row and 800 stores, you’ll always find plenty to do. Enjoy an NHL-size skating rink, California sea lions, the world’s largest indoor lake with an exact replica of Christopher Columbus’ ship, the Santa Maria, or see an underwater world with some 200 species of fish, sharks, sting rays and more. West Edmonton Mall is recognized by Guinness World Records as the world’s largest mall and is Alberta’s number one tourist attraction with more than 22 million guests per year. The on-site filming of a major motion picture reinforces the mall’s branding as The Greatest Indoor Show on Earth, creating another unique and exciting experience for guests and enhancing the mall’s world-renowned “show” atmosphere. Christmas in Wonderland is one of several major film productions recently filmed in Edmonton, including CBS Television’s Christmas Blessing, Lifetime USA’s For the Love of a Child, CBC’s Waking Walter and Warner Bros. The Assassination of Jesse James starring Brad Pitt. The Edmonton Film Commission receives year-round inquiries from numerous film companies interested in Edmonton’s scenic settings and world-class film production crews. Veteran producers Alexander Tabrizi and Henry Boger, along with writer/director James Orr, facilitated and brought this project to Yari Film Group and Insight Film Studios as a team to complete the financing. This major feature film is jointly produced by Insight and the Academy Award-winning© Yari Film Group, whose movie Crash won the 2006 Oscar© for Best Picture. West Edmonton Mall and the City of Edmonton are both named and featured throughout the movie. The Edmonton Film Commission, operated by Edmonton Economic Development Corp. (EEDC), along with Alberta Film, Travel Alberta and West Edmonton Mall, have partnered to bring this production to Edmonton. Support is also being provided by Edmonton Tourism’s Destination Marketing partners and the West End Hotel Consortium. “We are thrilled to be chosen as the location for this major motion picture and to be working with the acclaimed Yari Film Group and Canada’s own Insight Film Studios,” says Gary Hanson, general manager and COO of West Edmonton Mall.